For the past three days, I’ve had the old Goobers & Raisinets jingle playing continually in my head. The idea that my mind has been taken over by a television commercial from four decades ago is unsettling enough. But my real fear is that any day now I’ll go up into the attic, put on my old World War I uniform, and stop people on the street to tell them of my heroics in East Prussia. This is especially worrisome, because I don’t even have an attic. I hate billionaires. I don’t know why, but I don’t think I need a reason. If someone has that much money, a little animosity from me isn’t going to affect them in the slightest, and it makes me feel better. I used to hate millionaires, but there are too many of them now, so I’ve had to become more discriminating. Recently, I learned that Bill Gates and I share a birthday — same day, same year. I find this fascinating, because it means that when we were born he and I had the same horoscope, an identical and equally promising astrological chart. At some point, though, our paths began to diverge. By the time he was in the eighth grade, young Gates was programming computers. That same year, I was having a good day if I managed to remember my gym shorts. In 1995, he was named the world’s richest man, and currently has a net worth of sixty billion dollars. Two weeks ago, I had thirty-seven cents in my checking account. A large chunk of my youth was spent mining for prizes in boxes of breakfast cereal, or mailing the tops from those boxes to Battle Creek, Michigan, in order to get high-tech spy gadgets or other toys that looked impressively realistic in the ad — but turned out to be made of flimsy plastic — and then processing the inevitable disappointment that followed. The greatest letdown came with the ball-in-the-hole game. There were many variations, but all of them featured a clear handheld dome covering some sort of picture, and about a half-dozen tiny metal balls that moved freely on the inside. The picture had shallow indentations at various places. The goal was to tip the game back and forth until all of the balls were seated in the holes. But the holes weren’t deep enough, and maneuvering those last couple of balls never failed to jostle one of the others loose. No matter how hard I tried, something was always rolling around. For the true neurotic, that game is the perfect symbol of life itself. Sometimes I’ll drop something onto the floor, like a paper clip or a screw or a piece of lettuce. This shouldn’t be a problem, really, because the object fell just a foot or so, and it doesn’t have much ability to roll. I know exactly where it landed and it has to be within a radius of maybe twenty-four inches. But it isn’t. I get down on my hands and knees and with my face a centimeter from the floor I scour the area like one of those helicopters looking for airplane debris. Only I find nothing. Even after widening the search zone to include the hallway and nearby bedrooms, the missing item remains unfound. When I wore contact lenses, I’d sometimes lose one while hovering over the bathroom sink. I’d immediately freeze, and with my right index finger, draw an imaginary line straight down from my eye. A soft contact lens is like wet cellophane, and has no capacity to bounce. It should have been waiting there in the very spot where it came to rest. But it wasn’t. It had fallen through a rip in the fabric of spacetime and entered another dimension, a place rapidly filling with push pins, favorite shirts, ballpoint pen caps, DVD cases, the lids of food storage containers, and all of those emails I sent but that my so-called friends claimed they never got. Humans like to collect things. Little figurines, shot glasses, snow globes. I have a bunch of locks. All of the locks are closed, and I’ve either misplaced the key or forgotten the combination. I’ve had most of them for years, and I add to the collection on a regular basis. Once in a while, I hear a voice telling me that normal people would throw away the locks. But I won’t get rid of them, because locks are expensive, and there’s always the possibility that while I’m under the desk hunting for the bent staple I dropped, I’ll find one of the keys or a scrap of paper with a short series of numbers written on it. Meanwhile, I try to reassure myself that normal people also hear voices. Physical ailments are a common symptom of neurosis. 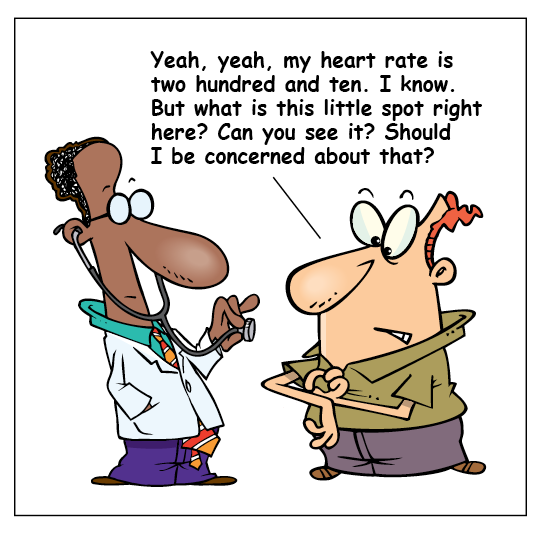 I have no desire to be common, so I rarely express these complaints, but the truth is, I’m a hypochondriac. I’ll notice a dark spot on my arm that I’m sure wasn’t there last week, and must be skin cancer. And that’s when I’ll see the rash: a swath of red bumps that are barely perceptible, but once acknowledged are impossible to ignore; it’s probably an early sign of smallpox. Every abdominal pain is an infected appendix, about to explode. Every dizzy spell is carbon monoxide poisoning. Every mosquito bite is the one I’ll remember in my brief moments of clarity, as malaria drags me through delirium, convulsions, and finally a welcome death. Even when my foot falls asleep, I attribute its cause not to the fact that I’ve been kneeling on a concrete floor for the past forty-five minutes, but rather to the initial stages of Lou Gehrig’s Disease. I may appear to be the picture of health, but I know a disabling back injury lurks behind every dresser I move, and every toothbrush I lift. Vacuum cleaners bother me. It’s the sound, I guess, and that long hose. 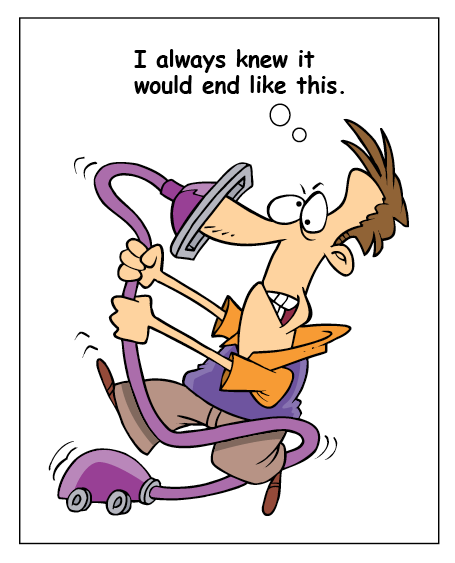 I use the vacuum cleaner all the time, so it isn’t a phobia, exactly, but more of a discomfort. It reminds me of a snake, only with a lot more noise. And it lives in the closet. Plus, it has attachments which, of course, are nowhere to be found. I used to buy rubber bands, and now I can’t remember what I needed them for. If I was out of rubber bands, I’d actually get in the car and go purchase a big bag of them. Hundreds of rubber bands in different colors and thicknesses. I don’t think I’ve used one this century, but still, every Thursday when the bundle of store flyers is delivered to the front door, I make sure to save the rubber band. Someday my children will inherit them, and later, their children. I will also leave them the entire balance in my checking account, to be divided fairly among them. And maybe my collection of locks. They’ll hate me, I’m sure, but I’ll be dead, and a little animosity from them isn’t going to affect me in the slightest. Anyway, it’ll serve them right. I bet none of them will want to hear my World War I stories. I have locks and rubber bands too. Every time I read your blog I wonder if we were separated at birth! It’s possible that we were. I’d check my birth certificate, but I have no idea where it is. This was soooooooo worth the wait! I can’t stop laughing…but, I am laughing with you not at you. Hysterically! Really? I kept you waiting? Now I feel terrible. I am laughing at you. Sorry. No need to apologize, Trisha. At least you’re honest. And dropping something only to never find it again. Drives me batty. How is this possible? Much like finding food in rooms my kids haven’t even been in yet. I think scientists should spend more time and money figuring this mystery out for us. I just lost a pen while reading your comment, Darla. I had the pen in my hand, wrote something, put it down, and now the pen is gone. I feel like I live in the Bermuda Triangle. You know the minute you throw those locks away, the keys will show up. That’s how it goes. And if I have 37 cents in my register but the bank says I only have 35, I’ll spend days looking for the error. Neurotic indeed. We’re just looking for a little bit of order within the general chaos, Renee. They can’t call us neurotic for that. About the checking account — no matter how sure I am that the bank made a mistake, it always turns out to be me. I too have a box of old locks. I also have a tin fill of keys. One day I’m going to take the time to sit down and play the dating game with them. That hypochondria this of yours concerns me, Charles. You could easily worry yourself to death over a freckle. Try long sleeved shirts. I forgot about the keys, Allan. I have dozens of mystery keys — I actually carry some of them around with me wherever I go. I’m sure I have keys to cars I no longer own and houses I no longer live in. Not exactly the simple life you write about, is it? No, not exactly hoarding. It’s saving, just in case. A subtle distinction, but a necessary one. I don’t have any old locks, but I have lots of old keys. Would you like me to mail them to you? Years ago on HBO a comedian named Rich Hall had a bit about “Sniglets,” or words that are not in the dictionary but should be. The “hozone” is where your old socks, push pins, contact lenses and emails disappeared to. I wonder if we’ve developed a tendency to hold onto certain objects, such as old keys, even though our logical minds tell us those things no longer serve any useful purpose. C’mon. You can’t hate Warren Buffet. 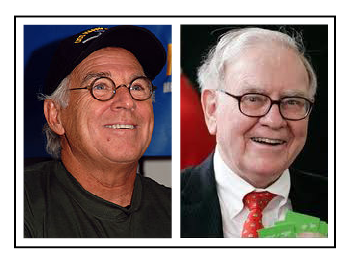 Warren Buffet is a nice billionaire. I’m sure he likes you. BTW, I not only have your lock keys but also know the combinations. If you want to ever be able to open those locks again, meet me tonight at midnight at the corner of Shore Road and Cow Bay Road, and COME ALONE ! That’s Jimmy on the left. I think. I was at the Tim Horton’s, with the locks. Where were you? Oh, are you saying that normal people DON’T hear voices?! Stop popping my bubbles like that! On the other hand, you just gave me my favourite line of all times: “I have no desire to be common” – Can’t stop rolling on the floor. Thank you! I haven’t actually met any normal people, Sandra, but the ones I’ve read about don’t seem to hear voices. Oh my goodness, you are just too funny! Funny (ha ha) or funny (please get some professional help)? Never mind: I already know. 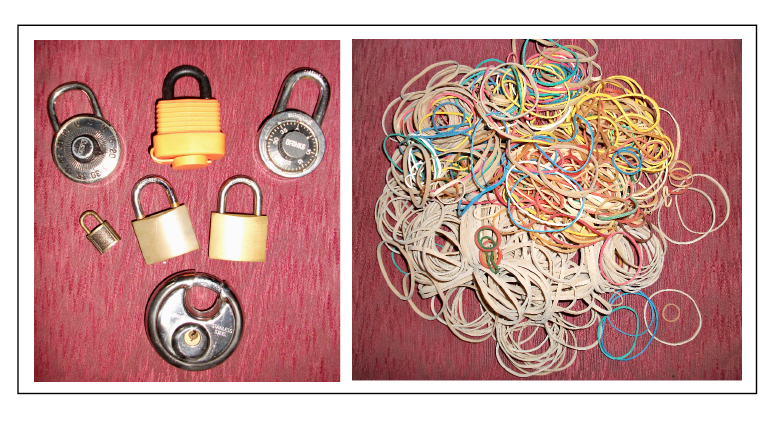 Locks and rubber bands. Wow. I’m so glad you’ve not yet succumbed to smallpox or Lou Gehrig’s disease. or dementia… Bless you, reading your neurosis posts makes me feel like the picture of robust mental health. And that’s really an accomplishment. You’re a great writer, Julia, but “robust mental health”? I hope that never happens to you. Mags, I wonder if the rubber band things is some remnant of the fact that our parents lived through the Great Depression, and the resulting belief that nothing should ever be wasted. You are neurotic, perhaps, but hilariously so. I’d take you, Charles over any sane person any day. Gosh, this was one of your funniest pieces! 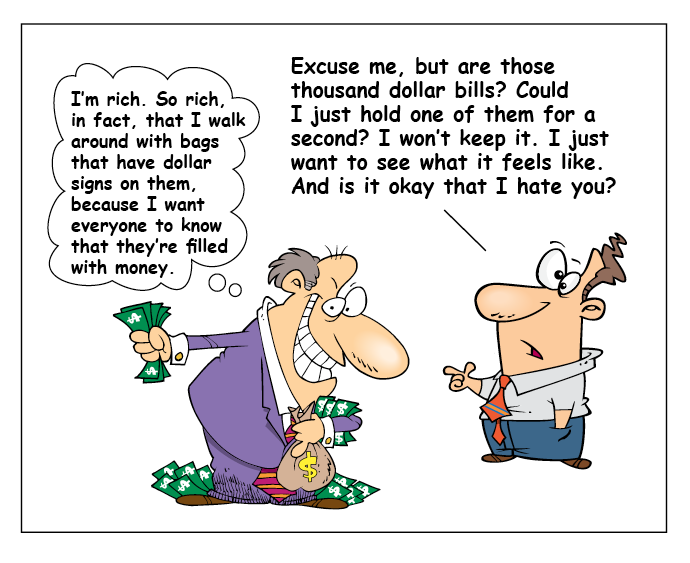 Your hypochondria, your losing things – your hatred of billionaires! Gates may have money but I suspect he’s a dry, dull person who doesn’t nearly delight people the way you do. You’re amazing. Thanks, SDS, but don’t think I didn’t notice that you called me insane. I bet Bill Gates would never say that about someone. Linda, I had trouble keeping soft lenses in my eyes for the two hours it took to play a softball game. I can’t imagine wearing hard lenses. My respect for you has grown, yet again. Like you, I have trouble parting with things. My obsession is every piece of paper I’ve written something on. I might just have to close my eyes and purge this or just learn to live with the clutter. I suspect you do have a knack for hyperbole and for milking your obsessions. Very amusing blog. Actually, Judy, clutter depresses me. I think if I were better at getting rid of the stuff I don’t care about, it would allow me to enjoy even more the things I value. I once bought a rubber band ball at Target because it looked cool and I figured, for $3.99, I’d have a lifetime supply of rubberbands. But then my kids un-banded them one-by-one and tied them all together in one incredibly long rubber band chain that they proceeded to wrap around all of the furniture. I don’t think I’ll buy any more rubber bands. Kids will always do strange things like that, but the minute you try to play with one of their toys, they go crazy. It isn’t fair. You know, they do actually go somewhere, those things that get lost. And you never usually notice when you find one. Not your own, I mean someone else’s. Because if you found a pen or a bit of string or whatever, chances are you just assume it was one of your own that you’d forgotten about. Or that a guest dropped. But one day I noticed one. A ten cent Euro coin appeared on my bed. I’d been reading and had a quick toilet break and on my return there it was. Right in the centre of the bed. Nowhere it could have come from. Nothing overhangs the centre of the bed. And I’ve never even been to a country that uses Euros. Unless it fell out of the paperback library book (surely not possible?) it has to have dropped through that wormhole of lost things. Someone somewhere is searching through their wallet sure they had another ten cents. But I have it. And they probably have that pencil I was sure was at the bottom of my bag. Don’t you wish you could have somehow stayed there to see the coin appear? It had to come from somewhere. I find pennies tucked into corners all over the house, and even in the car. It isn’t worth anyone’s time to place them that way, and yet there they are. The drop line I described was an imaginary one, but I’ve also tried releasing a second item of similar size and weight, just to see where it would end up. That never works either. Thanks for the comment, Bruce. I appreciate that you took the time. For me, when I think vacuum cleaner, I think ‘cockroaches’. In Australia vacuum cleaners are full of cockroaches. Well at least mine is. I hate the creepy crawlies way more than billionaires and at least most of them fit easily through the snake thing. I can’t look at the this common household appliance without getting a picture in my mind of the live ones crawling inside that vacuum bag among all the dust, rubber bands, clips and the odd coin. And I can only hope they won’t find their way out. Don’t know if that’s me being a neurotic swede in a foreign land. I’ve never liked opening up the vacuum cleaner to change the bag. The model we have now has a permanent bag that you have to empty and put back in. Your description of the cockroaches is going to stay in my head for a long time, and I will no doubt be using the broom a lot more. Thanks, Charlotte. I think. This was fascinating, because besides the mild hypochondria thing (I say mild, because I have a feeling you aren’t going to the doctor for every one of these), I am your total neurotic opposite. I don’t collect things and instead perform regular purges (often regretfully overzealous ones) of anything that looks like it might be unnecessary. I go out of my way to defend billionaires from anti-rich sentiment. I like to think someone will do it for me one day. I have an almost supernatural power to find things. And while I will occasionally pick up one of those little game-type things, I generally consider them a waste of time, so if I can’t win in twenty seconds or less, they get tossed. It sounds as though we really are neurotic opposites, Stephanie. I bet if we were in the same room together, we’d both vanish in a puff of smoke. 41-11-46 was my old high school combo…maybe you have my lock…if so could I please have it back. Thanks for the welcome respite from rhetorical theory, Charles. Good news: I think I have the combo to the lock on the top right, and the key to the lock in the middle row, far left. As for the rubber bands, do you use certain colors for specific purposes, as I do (ex. tan for keeping food bags closed, red for holding manuscript pages together, etc.)? Please say yes so I can feel normal! I don’t use the rubber bands for anything, Sarah. I just keep them, in case someday everything starts to fall apart at once. By the way, I found another bag of rubber bands yesterday. They’re all the same size and color, so I must have bought them for a specific purpose. The bag has never been opened. My mother-in-law used to save the rubber bands from her newspapers for my oldest son from the time he was five to about the age of 17. He added a band to the ball each time we visited her. When he went off to college, he left the ball, about the size of a basketball, in his room. I claimed it as my own, and as a trophy for the number of times I visited my mother-in-law. God knows I deserved a trophy! Can you lock it up in a safe place for me? That’s a lot of newspapers, AA. I’d be happy to lock up the rubber bands, but I can’t seem to open any of the locks. You know I could have sworn Andy Rooney channeled you for this post. Except….you’re a ton funnier than he ever dreamed of being. Ever drop a push pin in a shag carpet? You’ll only find it with your bare feet in the middle of the night on the way to the bathroom. I don’t have carpeting, Linda, but I’ve dropped sharp objects on a bare floor, where they vanished until I went walking around barefoot. That’s another strange twist to the mystery — how the thing manages to reappear at exactly the wrong time. Please let me know where you find your contact lense because that must be where all – ALL – of the other halves of my earrings are. I find parts of earrings all the time, usually while I’m looking for a dime that rolled somewhere. It felt as though I’d taken complete control of my life! Now, I throw every one out and experience the same joy. However, I now save square tabs with little holes that come off loaves of bread. Someone told me they were good for differentiating that snake pit of wires under my desk that came with computerization. I can’t bring myself to get under the desk and fight through the cobwebs to find out who belongs to what. It would likely be asking for trouble. Just when I got it all done, my computer, printer and phone system would all need to be replaced at once. I can’t bring myself to refer to it as a snake pit, but I have the same tangle of wires and cables under my desk. Using those plastic tabs to identify each one does seem like a good idea. I’ll never do it, of course, but now neglecting it is another thing I can admonish myself for. Thanks, Amy. And as for your hypochondria, I feel your pain (literally–it’s giving me a headache–I’m worried that it might be indicative of a tumor in my temporal lobe). If my husband, friends and doctors knew of all the physical ailments I have self-diagnosed, they would be amazed that I am still alive and well. Goobers are delicious peanuts covered with choc-o-late. Raisinets are raisins covered with chocolate, too! It’s been playing in my head pretty much every day this month. I’m starting to worry. I also wonder how much someone got paid to write that dumb song. Please make it stop. The most likely explanation is that the commercial is some sort of weird hallucination, just like that Alka-Seltzer jingle you mentioned. This line was great, “By the time he was in the eighth grade, young Gates was programming computers. That same year, I was having a good day if I managed to remember my gym shorts.” Even if you have the same astrological forecast, I’m not sure how much stock I’d invest in a horoscope. Sometimes, they can seem frighteningly accurate and others — well, that’s why predictions exist in general, I suppose. To get us wondering. To answer things that don’t make sense. And to be just ambiguous enough that we can discount them when they don’t prove true. Either way, maybe you could try the current Microsoft stock price as one of the combos for your locks. Now THAT would scare you more than the vacuum, I’d bet! I’ve never put any faith in astrology, Melissa, but I understand that it can still have value. In a similar way, hearing the predictions of a psychic can move you in a certain direction — even if she has no more power to see the future than anyone else does. I get a strange sense of comfort from reading fortune cookies. Maybe they’re all just reminders of what could be. If you ever want your astrology chart done let me know. It might be interesting to learn what your Moon and ascendant is as well as your Sun sign. I’m a Scorpio, Bekki, and that’s about all I know. Does your chart depend on where you were born, as well as when? Let’s give it a try one day, Bekki. You can’t scare me. Thank you, Shama. Your kind words are always welcome.